Trust A Collision Repair Shop Who Cares About Your Vehicle! We fix your car right the first time. From the second you leave your car here McCurdy Body Works your vehicle undergoes a strict repair process. We take pride in restoring your vehicle back to it’s new factory condition before the accident occurred. Collision Repair has been our specialty for over 73 years. Every vehicle is unique; therefore, we stay up-to-date with the latest models, technologies, and equipment to repair your vehicle the correct way. At McCurdy we do things the right way, if you are unsure about another shops collision repair feel free to bring your vehicle in for a secondary inspection. We offer full scale collision repair services. There is no job to tough for McCurdy Body Works and our quick repair process will help in less time of you being without your vehicle. Come in for an Estimate at our location in Pasadena. McCurdy Body Works is waiting to fix your vehicle. Since 1945, McCurdy Body Works has helped drivers get safely back on the road. With iCar-certified technicians, we have the knowledge and expertise to fix your vehicle the right way. From minor fender benders to vehicles declared a total loss, we’ve got you covered. Estimates Are Fast and Free, So Come On In For An Accurate Inspection! McCurdy Body Works uses a multitude of techniques to remove those unwanted eye sores. Our trained staff is skilled at making it appear as if it were never there. This includes your average parking lot door dents to entire cars being keyed McCurdy’s has your back and we promise quality service. Our Certified Technichians are experts in unibody and frame repair, straightning, and/or pullling. We do both front end and back end repair. Our experts are trained in Frame transfers, cab removal, and more. When a vehicle is involved in a accident the damage can go unseen. 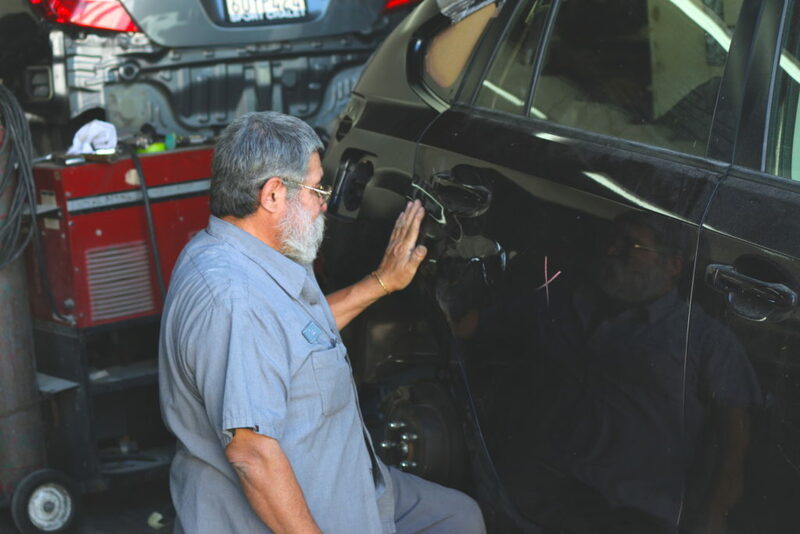 We fully inspect your vehicle for additional damage between your vehicle’s tires. We replace damaged struts, control arms, and more. Any vehicle with suspension issues is sent to alignment.